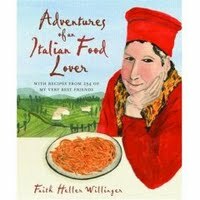 I've been reading Faith Willinger's newest book, "Adventures of an Italian Food Lover." It's quite a fun read. She takes you all over Italy and profiles lots of her friends and includes "254 recipes from my very best friends." And she's not kidding. She knows everyone. For those of you not familiar with Faith Willinger, she is quite famous in the Italian foodie world. She is an American who has been living in Florence for 25 years. She's written a number of cookbooks and she travels and speaks and gives cooking lessons out of her home in Florence. She does "market to table" lessons where she takes the class to the produce stands and selects what's fresh that day and everyone goes back to her home to cook. I just had to try this pasta from Osteria Antica Marina in Sicily. It's a light, delicate dish. Peel and clean the shrimp. Combine the shrimp shells, tomatoes, and 2 cups water in a large saucepan. Simmer for 30 minutes, then strain the mixture and reduce the broth over high heat to obtain 3/4 cup stock. Adjust for salt. Combine the almonds, pine nuts, mint, basil, garlic, and 1/4 cup of the stock in a blender or puree with an immersion blender. Bring a pot with 6 quarts of water to a boil. Add 2 to 3 tablespoons of salt and the pasta. Cook the pasta until if offers considerable resistance to the tooth, around three-quarters of the package recommended cooking time. Drain the pasta, reserving 1 cup of the pasta water. Transfer the pasta to a large skillet or a 3 or 4 quart pot. Add the pesto, 1/2 cup stock and the shrimp. Cook over high heat, stirring gently and frequently, until the past is cooked through and the shrimp are hot. Add the pasta water, 1/4 cup at a time, if the sauce seems dry. Add salt to your taste. Tip: Yes, they are serious when they tell you to add 2 to 3 tablespoons of salt to the pasta water. In Italy, they believe the pasta should be cooked in very salty water, to flavor the pasta, and it should have the "taste of the sea". Tip: When simmering the shrimp shells to make the stock, simmer very gently and if you are losing too much liquid, put a lid on the pot. I just have to tell you how much I appreciate your work! My great aunt (Angela Catanzaro) was a test cook for Red Star Yeast and Italian American cookbook writer. Seeing your food and wonderful ideas reminds me of her so very much. If I didnt have cooking and knitting to do I would spend all day ogling your blog. Thank you so much for your time and dedication to this wonderful project.